Providing you the best range of consyst cys 400 ey 1:1 pure epoxy, consyst ce 500 pure epoxy 1:3 585 ml and rebaring work with effective & timely delivery. 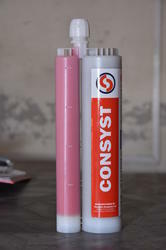 CONSYST CYS 400 EY is a 2 component high strength pure epoxy chemical anchoring resin moter system.It is designed for deep embedment and large diemeter holes due to its zero shirinkage and longer working times. CYS 400 EY is suitable for diamond drilled holes with rebar and in areas of high chemical exposure eg.seasalt and swimming pools. 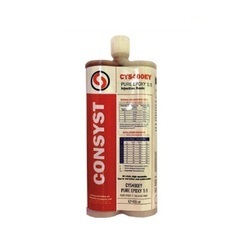 CONSYST CE 500 is a component high strength pure epoxy chemical anchoring resin system.It has the advantage of european technical approvals for post installed rebar,used in cracked & non crncrete plus WRAS & fire rated Certificates. CE 500 is relative slow curing injection motar system,thus ideal for very large fixing & is delivered through a mixing nozzle directly into the fixing hole.the cartridge and extruded using a special designed fixing tool. 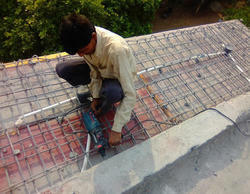 Owing to the expertise of our team of experienced professionals, we are able to manufacture and supply an exclusive range of Rebaring Work. Looking for Rebaring Work Chemical ?